This is my first recording on CD of primarily original music. The majority of the songs are voice and dulcimer, but a third of them are voice and guitar. The instrumentals are derived from traditional Celtic and Gypsy tunes, and Oriental music. I've included some of my earliest songs and ones written just before I recorded them. I usually compose on guitar or piano, because I play dulcimer so much its hard to keep my hands from automatically doing something they know, when I'm trying to do something new. Then I move the songs to the dulcimer when there done, but some end up staying on piano or guitar where they started. 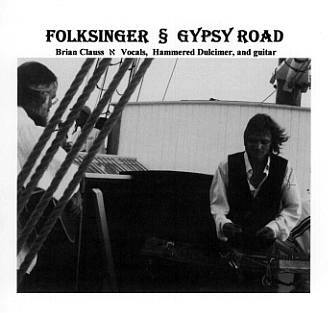 I recorded these at the same time I made the "Folksinger" CD, over a couple sessions at The Private Ear, Key West, Florida. Again, they were all the product of a few takes, sometimes just one. I was performing a lot, and you have to get it right on the first try when you are playing live. This is therefore more of a live show in the studio, without an audience. My present recording project is again original songs, but with Keena gone, "Primal Howl" can't be done again. Though I intend to use some of these tracks on the new CDs, and that will be one of them. "...a place to play, a song to sing, and hearts that understand". The "Gypsy Road" CD is in response to people's interest in hearing songs I have written. I have never really tried to be a songwriter, though sometimes songs would spring forth whole and unbidden. I never felt the need to try and force songs out of me. It always seemed strange to make my feelings rhyme, instead I've kept extensive journals. But it seems that people enjoyed my songs, even if I sang them rarely, usually only if someone specifically asked for an original. Frankly, I am much less sure of my own songs, both music and words, because I play them so seldom. Though the Hammered Dulcimer has been my performance instrument for the last 14 years, on a good part of this CD I play guitar instead. 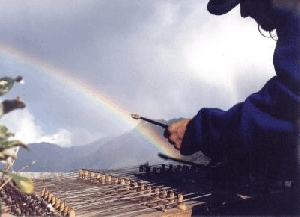 Not all my songs fit as well on solo Dulcimer, were not written that way or don't adapt easily. For example, Simple Things" is about just that, and the Dulci is often rather "busy." The guitar can be simple, and that's how the song was written, with a simple finger-picked accompaniment. I have included some of my earliest songs and some I wrote while recording this album. I won't try to claim that every song is a masterpiece, but they are my songs, my life and story, and that is what people have asked for. I have never really considered myself a songwriter, but rather, a Singer. I said it's like expecting an actor to be a playwright, or a violinist to be a luthier. But while playing for a poetry reading, I was asked if I'd like to read. I said I didn't write poetry, then realized this wasn't true. In fact, I had begun writing poetry in elementary school. In a meditation probing this self-deception, I saw that I had always written poetry and songs, and my early journals (I am a prolific writer) are full of them. I realized that I had denied that part of me, partially to deflect self-consciousness and stage fright, and because I've always seen myself as a channel for the music, not it's source, a humble servant bearing gifts, not the master of creation. I also realized that the creative process is like a dream, with the songs springing nearly complete, lost and forgotten if I do not write them down. And even when I did write them down, I would turn the page and forget I'd written anything! So I've made the effort to retrieve my old songs, and to let myself write new ones. This is the result, I hope you enjoy them.